So I though I’d do a little run down of my favourite tea and tea companies, there are lots of independent tea companies around making some great blends. One of the first teas I tried in the quest to broaden my tastes. This is a rooibos tea with rhubarb and sunflower, it is naturally sweet – works with or without milk. I am drinking a cup of this right now. Good if you like a traditional cuppa, it is caffeine rich so good for an afternoon slump or for keeping you alert whilst writing blog posts! I also bought their Tea & Biscuits multi-pack which is a great way to introduce yourself to all their range, and they are a really ingenious gift idea for tea lovers. Shout out for a local company! Kandula Tea are based in Cambridge, their loose leaf and tea gems are stocked in lots of local delis and shops in and around the city. I’ve just placed a big order from Kandula for peppermint, pink ceylon (which is actually pink, lovely) and English breakfast. Their chai tea is just gorgeous. I tried some as recommended with some chocolate, they go so well together. The loose leaf blend (and the tea gems) come with real whole spices in it and it tastes really fresh instead of the usual musty chai you get. Really looking forward to receiving my order. Pukka are an independent tea company but slightly bigger than the others I’ve featured, they have about 40 staff and they sell health food products as well as a great range of teas. Their teas are available in most supermarkets in lots of different flavours. Their three mint tea is one of my regular cuppas, I drink peppermint a few times a day and this one is the most minty of the teas you can buy in mainstream shops. They have loads of different flavours which I want to try, and also I am a sucker for their lovely packaging. Hope you enjoyed my tea round up, what is your favourite tea? Do you have any other independent tea companies to recommend? Contrary to how it may look it isn’t all cakes, meals out and sandwich cookies around here. Unfortunately I have had to recently rein in my unhealthy eating which has meant exploring a whole new area of the food blogging world – healthy food blogs. – Dressing – I usually go for simple olive oil / balsamic, or olive oil and mustard, you can try soy and honey. As long as it isn’t a fatty creamy dressing. 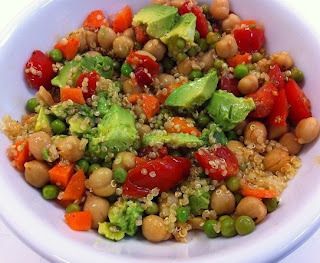 My most recent one was a base of cooked quinoa, chickpeas (canned), peas, chopped carrot, sliced avocado, local cherry tomatoes and a mustard, olive oil and honey dressing. It was so filling, fresh and very summery. It took about 10 minutes to prepare, whilst I waited for the quinoa to cook I drained and add chickpeas, chopped veggies and made my dressing in a little jar. I sliced my avocado before eating to stop it being brown. I’ve tried it again a couple of times since then – using cannelini beans, spring greens, spinach, bulgar and my usual dressing, and my trusty avocado. Toasted pine nuts are also a nice addition, I always toast too many when I make pesto. Now I have a formula I feel armed with the ability to make better lunches! I was looking at my blog last night and realised how neglected it has been recently, poor blog. I’ve been busy with my new job (which is great) and making jewellery but I have still been cooking some nice things. I’m pretty good at snapping pics on my phone and putting them on Instagram, which has been about all the blogging I’ve been doing lately. Here are some of my favourite things from the last month. Glazed sesame chicken, thai green butternut squash curry and fluffy basmati rice. Bubble and squeak cakes with roasted fennel and squash warm salad. My first go at trying roasted fennel, I always thought the aniseed would be too overpowering but it is just right, adapted from River Cottage Veg, I missed out the spelt to keep it simple, the flavours were still there and it all worked together really well. The bubble and squeak cakes were some leftover mash, shredded cabbage, an egg, garlic, lots of parsley and seasoning, fried til crispy on both sides. I was so pleased to make the latest cake club meeting at La Tasca in Cambridge. Lyn, the founder of Clandestine Cake, was our guest of honour, it was lovely to meet the lady who started it all off. There are now over 60 clubs in the UK and across the world, find your club here. I baked a rhubarb victoria sponge (unpictured, it tasted good but was pretty unphotogenic!). I love going to cake club, I always come back brimming with ideas and high off a sugar rush. Crispy Baked Onion Rings – I made these twice in one week. Enough said! Creamy Avocado Pasta – Avocado is one of my favourite things to eat, this pasta dish is super quick and I found I didn’t even need to add parmesan, which is a first. Crispy Tofu Strips – I am slowly learning to like Tofu, I think it works well in a handful of dishes. Silken tofu is normally my favourite, this is a great way of using firm flavoured tofu (I used basil, but you can also get smoked) in a healthy way. Teacake in Shepreth – My new favourite tea room / cafe. And it happens to be 2 minutes away from my office. Win win. Carrot Fries – almost guilt free chips. Almost. I love a good food programme, I will watch most of them and feel very hungry afterwards. I really enjoyed watching the Great British Bake Off, mainly because they covered so many areas and it has given me loads of ideas. I got Ed Kimber’s, the winner of the first series, book for Christmas. Looking for something simple to make one day with a large craving for cake that I wanted to quickly satisfy, I made the ‘Peaches and Cream Cake,’ but with some cooking apples I had in my fruit bowl. It is a lovely cake, quite creamy (is it says) and the caramel and fruit is just lovely. I have lots of other recipes queued up to try, I think the PB & J bars are next. It is a lovely book, beautifully shot (unlike my photographs) but not too arty and there are loads and loads of recipes inside. I’m going to try his macaron recipe too, see if I can improve on previous attempts. Just a quick blog post to let you know about a lovely Italian restaurant that has just opened up in Saffron Walden. I’m really pleased because it is hard to find Italian food not dominated by chain restaurants. They serve pizza, pasta, mains and salads, and importantly puddings. We stopped by for the very good value lunch menu, £6.95 for a large range of dishes. 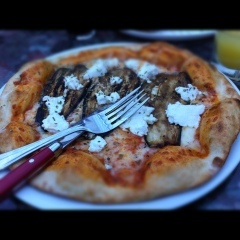 I had a grilled aubergine & ricotta (the ricotta tasted house made too) pizza and Mr. a panini which was basically a cross between a wrap and a calzone. Both cooked in a pizza oven. We will be going back again very soon! Update, January 2013: I walked past recently and it turns out this restaurant is now closed, it is now an Indian restaurant. Such a shame as those pizzas were brilliant.